I think I is now too stupid to be Prebematerian. I knoe we get to vote on stuff. I knoe we chuse. It is good to be chusing, I think. It hleps helps us figure what we all thing think 2gether. Alot of the time we r gud 2gether. Wen we r bad we fite about the things we think. But sumthin make my head all hurt and stuff. Wut iz that thing? O thank u for asking! U r nice. Next month, I get to vote on two things. Standards for ordained service reflect the church’s desire to submit joyfully to the Lordship of Jesus Christ in all aspects of life (G-1.0000). The governing body responsible for ordination and/or installation (G.14.0240; G-14.0450) shall examine each candidate’s calling, gifts, preparation, and suitability for the responsibilities of office. The examination shall include, but not be limited to, a determination of the candidate’s ability and commitment to fulfill all requirements as expressed in the constitutional questions for ordination and installation (W-4.4003). Governing bodies shall be guided by Scripture and the confessions in applying standards to individual candidates. I cut them and paste them all by myself 4 u. It was eesy and I can sho u if u like! It has alot of big words, and numbers that only Presypaterbeerians know what they meen. But a fren tol me wat it meens. It meens peeple we chuse to leed can figyur out who is reely good and who God wants to tellus about Jesus. We haf to kno they love Jesus, and we can yous the Bible and other good buks we like and that small Voice to kno they will be True. The uther thing we used to said insted, the Gee-Six-Bee, was not Good. It was an angry stingy Bee, and pointed fingurs at sum peeple more than uther peeple, just like my friend Paul said was bad to do. That is not veri gud. And nobudy can really do it, or reely knoz wat it meens x ept to be angry at sum peeple. It was jus there to be fighty, sted ov jus finding where everbudy can be 2gether and do Love like what Jesus said we hav to do. I like ten ay much better. So I will vote 4 it to shoo away the bad Bee that helps us be crazy and fighty. But then they say I need to vote on the enFROG. 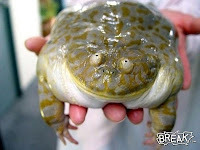 I do not no y it is a enFROG. I don kno about even the old FROG. Is the new FROG more jumpy and green? I don't no. But i no there smart peeple who say our old FROG is too big and bumbledy to jump enymor. I liked the old FROG, beecaws sumtimes I can't sleeep, an it hlep help me alot. But x ept for the Gee-Six-Bee, the old FROG was OK. U cud stil figur it out, an it wuz too fat to get away wen u tri 2 pet it. So now Presbtyrrearinhands ar talking bout the new FROG. And the Gee-Six-Bee liking peeples are all mad, becuase they say it is YOuneeversalism. Frum wat they say, that means Jesus hates u unlez u go to curhrh clurch chruch. I do not no y that is good, but they say it. So they will vote no. And many ten ay peeple wil vote yes, beecuz they say enFROG is better and jumpier. The enFROG seems nice. Jump, litl froggie! Here is y my hed hurts. Ten ay takes the bad Bee out of the old FROG, the bee that stung it inside and made us sick. So I will vote for it so we can do what Jesus wants. But then I red the enFROG. O nO! Luk wut I c! The enFROG has all the wurds of the bad angry Bee still inside! It pretends 2 b a Two-O-One-Bee, but it is really the same Bee! O no I do not like the Bee! I do not want to vote for the Bee! 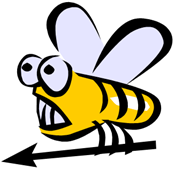 I do not wnat to see the bad B again, b-cuz I am tired of fighty Bees! Y wud I vote one thing, and then vote 2 go back and make the furst vote not do n-e-thing? That iz not smart! But no won seemz to c! The people hoo say no to ten ay, they do not want the enFROG, even tho it has the Bee wurds they say they like. And the peeple hoo say yeah to ten ay, they say yeah to the enFROG, even tho it has the Bee wurds they say they do no like. Ow! Ow! My hed reely hurts frum beeng in Presytafearylands! A fren telz me it is coggytiff dissypants that makes it hurt. I don't kno wut that iz, or y I wud wear those dissypants on my hed. That's not wear pants go! Maybe they r tite on my hed! So I think I wil vote for the ten ay, and not the enFROG. Ah. Better! My hed feels better, tho I am sad about the new froggie. He might hav been nice. Even better! A fren tells me that if the ten ay happens, it happens to old fat FROG, and new happy jumpy FROG too! I did not no it! No one said so to me. Oh my! Now i can vote for enFROG and ten ay, and not have to wear dissypants on my hed. But I still prolly not smart enugh to be Preberearichan. So hard to figur out all the stuff.